I walked over to City Hall Park and poked around a bit. I didn't expect that I would be able to access the site (and I wasn't), but at the very least I figured I'd be able to get a sense of what was going on and possibly a picture or two to share. 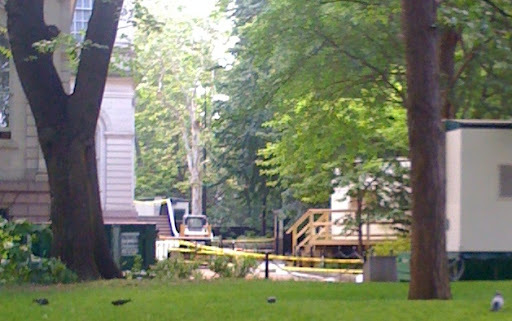 Known as the City Hall Park Project, excavations have been going on around City Hall since 1998. The area was important to the developing city and is home to 25 trash pits and 26 architectural features. Currently undergrads and graduate students at Brooklyn College, Hunter College, and the CUNY Graduate Center are working with the 250,000 artifacts that were retrieved from the site. 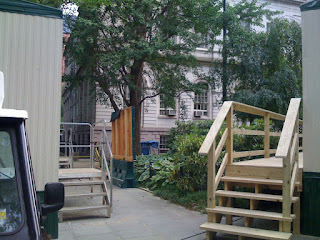 I think I managed to track down the location of the dig, but there was no way to get through the fence. The plan is to eventually create public exhibits to showcase some of the historical elements of the neighborhood. I've contacted the Brooklyn College anthropology department to see if someone will talk to me about the project, so there may be more on this to come. Above: View from Centre Street. bushes near the blue tarp. Despite not being able to investigate the wall a bit more, I was really reminded of how deeply connected the area has remained to the New Amsterdam colony—there's plenty to discuss with regard to City Hall itself and the Tweed Courthouse, so stay tuned.